Almost fourteen billion years ago, when the universe was only ten human heartbeats old, light appeared in the universe. The young universe was dominated by dense matter, so at first the light was constantly scattered and absorbed. The universe was so dense with charged particles that the light could never travel far. After about 380,000 years the universe cooled to the point that the charged particles (by then mostly nuclei and electrons) united to form atoms of hydrogen and helium, the first atoms of the universe. With this union light was no longer heavily scattered and absorbed, and so this earliest light of the universe began a journey across the cosmos. Galaxies formed. The first stars were born. Many burned brightly for a while and then exploded as violent supernovae. New stars and planets rose from the ashes of dead stars. On at least one world life appeared, and after a time looked up into the vast sea of stars. Beyond the sea of stars the first light still glows dimly. Once as bright as the surface of a sun, it has reddened and dimmed due to the expansion of the universe so that it is now just a faint glow of microwaves. And yet that faint glow still carries the imprint of the first cosmic spark from which it rose. 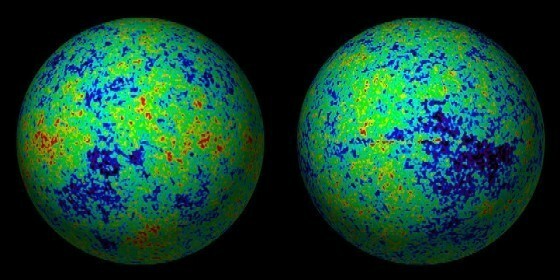 Humans first observed this cosmic microwave background (CMB) in the 1960s. Early observations demonstrated the CMB had a temperature of just 3 Kelvin, which demonstrated the origin of the universe from a “big bang”. By the 1990s the COBE satellite observes that the CMB is not uniform, but has small temperature fluctuations. Thus we learn that the early universe had structure. In 2001 a more sophisticated probe known as WMAP begins a 9 year survey of the CMB. From its data we could confirm a universe about 13.8 billion years old. An expanding universe consisting of about 5% regular matter, 24% dark matter, and 71% dark energy (as I’ve written about before). Then in 2009 a new probe named Planck was launched. 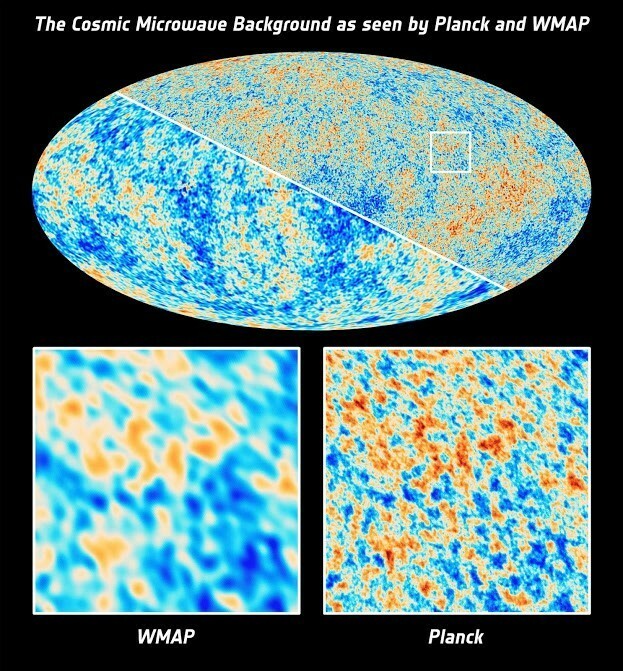 This probe examines the CMB at a much higher resolution than WMAP did. You can see the difference in the image below. Last year the first results from Planck were announced. 1. The universe is 13.82 billion years old (a little bit older than we thought). 2. For the mass/energy of the universe, 4.9% is regular matter (stars, planets, and us), 26.9% is dark matter, and 68.3% is dark energy (a bit more regular and dark matter, and a bit less dark energy than we thought). 3. The universe is expanding, with a Hubble constant of 67.3 km/s/Mpc (a bit more slowly than we thought). For generations humans looked up at the night sky and had only questions. Now we can look up at the night sky and know. Not just what stars and planets are, but the whole sky, the universe in its entirety. And yet there are still more questions to be asked. Within this new data is evidence of a “lopsided” nature to the universe. The CMB has a subtle asymmetry to it. There’s a new kind of structure to the universe that we don’t entirely understand. We now know so much about our universe, and yet we still look at the sky and wonder.